Defender Naoki Matsuda played in all four of Japan's games at the 2002 World Cup. (CNN) -- Naoki Matsuda, a former Japan defender who played for his country when they co-hosted the 2002 World Cup, has died after suffering a suspected heart attack during a training session on Tuesday. The 34-year-old's death was confirmed by his club, third-tier side Matsumoto Yamaga, on Thursday after he had been rushed into hospital two days ago having collapsed. Matsuda, who also had a 15-year spell with Yokohama Marinos between 1995 and 2010, represented his country on 40 occasions and was part of the Blue Samurai squads which won the Asian Cup in 2000 and 2004. The right-back fell into a coma before being placed on life-support and did not regain consciousness after being taken ill on Tuesday. "I can't believe it," said former teammate Shunsuke Nakamura, according to AFP. 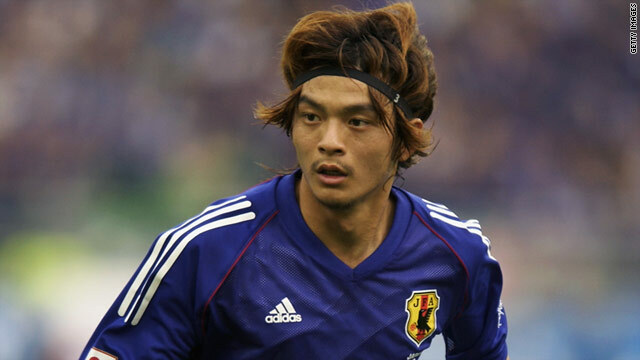 The 33-year-old former Celtic midfielder played alongside Matsuda with both Yokohama and the Japan national team. "He was dynamic in every aspect and he was a kind of big brother for everyone in a positive sense," continued Nakamura. "Matsuda was a kind of loyal soldier," remarked French coach Philippe Troussier, who was in charge of the Japan team which reached the second round of the 2002 World Cup. "He listened attentively to what I said. He was polite and always a reliable key man in the team." Japan Football Association technical director Hiromi Hara added: "I have managed or coached teams playing against him many times and know what a big presence he had." Matsuda's death comes weeks after Japan celebrated their women's team becoming world champions for the first time in Germany.